Today started out nice, the sun was shinning, it was a nice warm day, and Ben even got his dads ATV out for a ride. Jeff had to work on his riding mower, so he wasn’t able to ride with us today. We saw him out at The Island, and talked with him for a while, he was just killing time till someone got back with the parts he needed. A couple ATVs came riding by, and stopped to talk to us. They asked where we were planning on riding, which we really didn’t know. We didn’t really feel like heading all the way out to the ash dumps today. So we hung around with them and took turns leading the way on local trails. Toward the end of the day, we were heading up a very rough and technical trail. There are lots of ruts and rocks. One section of the trial has a very steep, but not too tall hill climb. It didn’t look all that bad, but it was rather slippery, and it sloped off to the left. The two guys we were riding with seemed to climb it relatively easily. The last guy sliding a bit to the right. Next was my turn. I hit it alittle to the left, where it looked less slanted to the side. I made it about half way up, when I started sliding to the left, downhill. Just then, I noticed a large culvert sticking out of the side of the hill. That’s when I knew I was completely F**ked. I was still sliding over to the left, and my front left tire dropped off of it, with was about 15 inches till the tire impacted the bank. That sent my rolling right over the side of the bank. I managed to barely get off the ATV, and landed on my side, and had time to make a half roll onto my back. Just then I look up, to see the ATV come tumbling right behind me. I could have made about another half roll onto my other side, but I didn’t want the ATV to crash down on my side. So I through my arms and legs up, trying to brace myself for the impact. It landed right on me, right side up. One back tire landing on my leg, and the other on my head and shoulder. It his me hard, and naturally, hurt like hell. I was worried that my ankle was broken at first, but I noticed I could move it. Ben was quick to jump off his ATV, and run over to me, asking if I was ok. I told him I was ok, and to lift the ATV alittle, he did, and I was able to roll out from under it. Amazingly, the ATV had landed upright, although on me, and had not hit the handlebars at all. You couldn’t tell it had been rolled at all. I wish I could say the same for me. 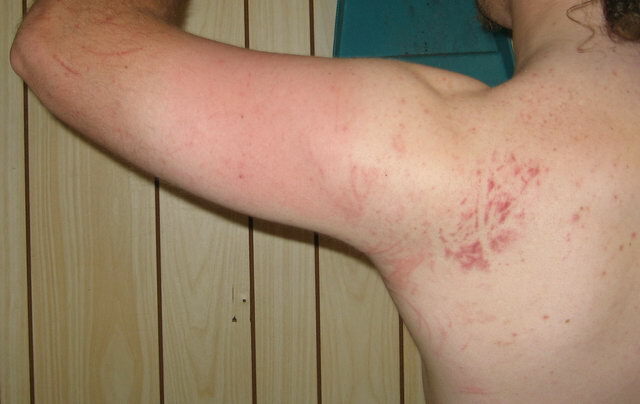 I suffered a bit of bruises and scratches, as I landed right in some briers. 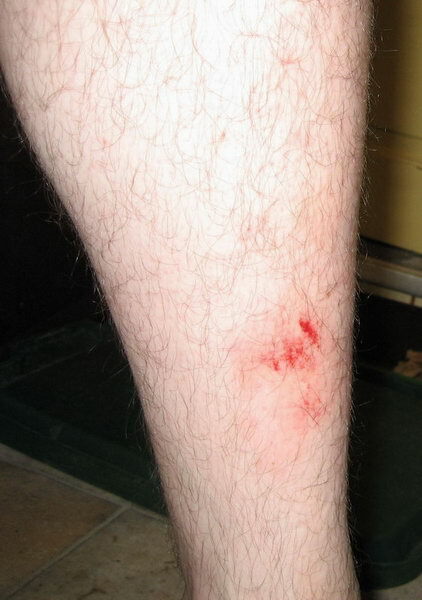 My angle was bloody from my sock and boot being pressed against it so hard. The metal shoe lace loops on my boot were actually smashed closed. My ankle is still pretty sore, and both my shoulders got tweaked alittle trying to hold the ATV back some. I am supposed to go riding with Brent tomorrow, I just hope I am not too sore. My entire body aches, but I suppose it could always be worse. Just goes to show you, things can go wrong at any time, even when you aren’t riding aggressive.